So, I've fixed the mast and fixed all of the aerials. Only the blue and orange lights to add now. The mast's not as sturdy as I'd like; The break is only held by superglue gel but there wasn't another option! The aerials are as per the real boat this year and so there's a few changes. Hopefully the photos will tell the full story. All of the mast aerials are 0.8mm brass wire with brass tube at the base. The small aerial on the port side has two thicknesses of tube. It all looks pretty good to me. What's not so good is the starboard railing. It broke again at the side steps, at about the same point. The rail is plastic tube with a brass rod core. I can only think that the brass I used wasn't long enough hence the weak point. Anyway, I pinned and superglued the joint so fingers crossed for this time, and a lesson learnt for the next boat. The bridge comms system is all painted now and just needs putting together, and that should ten mean the flybrigde is finished. Photos hopefully in the next post. Little to report this week due to a busy week and weekend. Nevertheless, I've glued the last pieces of fendering on and the side rail wires are also on. I've also started to scratch build the flybridge intercom units. Hopefully, they'll be the finishing touch to the flying bridge. The parts I've put together are in the photo below, prior to assembly and painting. The finishing line is getting closer. This week I've been mainly pottering about, just adding a few bits here and there, but the boat's now looking much more complete. I've fixed the stern rails and side stern rails, along with the flybridge screen. Now just a few more bits and pieces to add, and to rebuild the mast which took another hit in a clumsy moment. 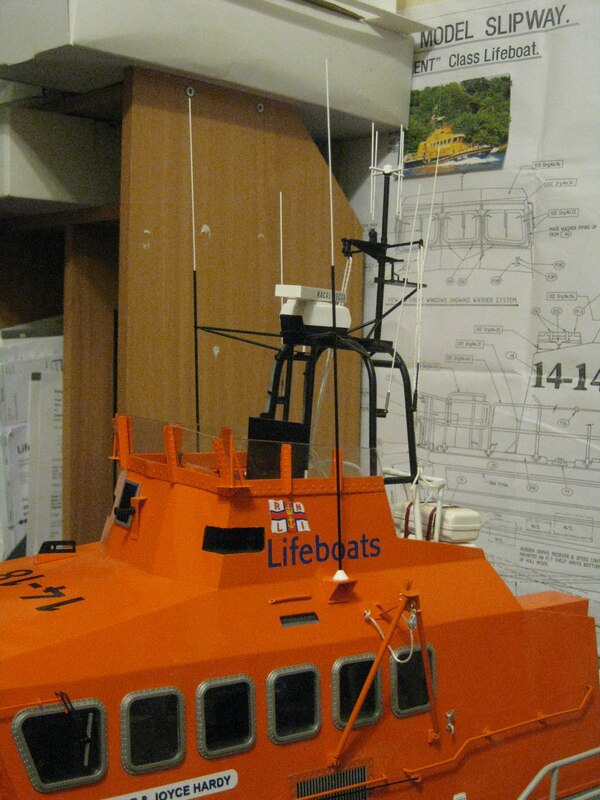 As I've a picture of the stern, I thought I'd describe the modifications I've made here. At the bottom are the trim tab mounts. These are simply lengths of 6x3 styrene shaped and blended with filler. A friend is making some adjustable rams for the trim tabs on his lathe. The oil overflow pipes have been added. The biggest change though was to build recesses for the exhausts. A hole was drilled and then reamed out on both sides. The recess was actually made from a pritt stick lid. The exhausts then sit in the recesses. They're not deep but they are noticeable on the full size boat. Just visible in the photo is the engine room hatch. I've scratch built this to the more flush current type, using the kit part as a guide. I've also used checker plate on it . Also seen under the flybridge stairs is the X boat motor. Just to finish off this post is a photo of the model from the side. PS The flyer to the right of the shot is not for the Nuremberg rally, it's for Richard Herring's Hitler Moustache tour - dvd available from Go Faster Stripe! I've made lots of progress over the last couple of weeks since my last post. The biggest task I've completed was the windscreen washer system. This is now on the boat along with the wipers. I thought it would be a real challenge to make up the pipework, but it really went quite well. I've also fixed the side railing stantions and back plates in place. This went much quicker than I'd expected. I used a photocopy of the plan cut to fir the deck to make sure all stantions are vertical. I've found the fendering quite challenging. It's almost finished now, but not after some frustration. It's not that difficult, but cut in the wrong place and that's it. Fortunately, it mostly went to plan.I used a glue that's supposed to stick nearly everything for the main run round the hull, and although it's ok, it's not great. I had to resort to superglue gel for the other pieces.